This is the first blog from our 2018 Microgrant winners. 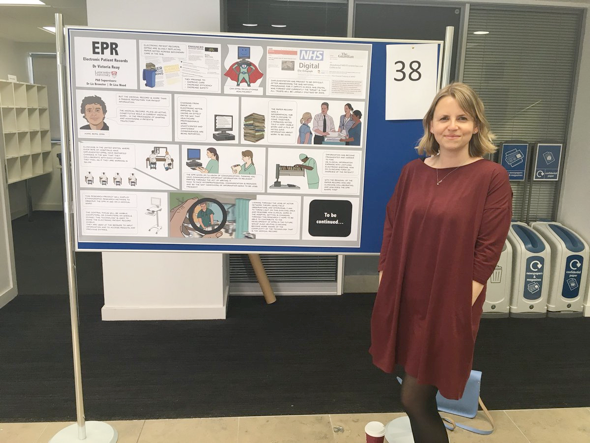 Victoria Reay, of Lancaster University, was awarded £200 for working on a project to see how electronic patient records affect the way clinicians work together. Read her story below. My PhD is going to examine how using electronic records shape the way that hospital work is done in the NHS. This idea grew out of personal experience. I was working as a doctor on an inpatient unit in a hospice in Cumbria, when our record keeping system changed from paper to digital. Instead of writing a patient’s notes on paper, the new system required that all information was entered into an electronic record, via a desktop computer. It's generally accepted that digitisation of medicine is inevitable; it's inconceivable that we will continue to use paper in a world of computers. Healthcare has so much to gain from the systematic accumulation of information. But, we need to look critically at the way the computers themselves change the way that work is done. From my own experience, I saw that computers moved people away from patients. Do the requirements of electronic records change the way that clinicians talk to patients or communicate with each other? Medicine is a messy and complex business, and the experience of healthcare IT is not always best captured with quantitative research. In accordance with this, I will be using ethnographic methods. I plan to spend time on a medical ward, watching work being carried out and interviewing staff, to explore the ways in which using the electronic record is different to paper. I hope to translate and articulate shifts in working practice back to both clinicians and medical informaticians, in order to be able to guide design of future electronic records to best suit the way that the work is actually done. The advert for the Microgrants came out at a time when I was hammering out these questions. I was attracted to the ethos of the award and that it placed value on the researchers’ own stories. Just as a thesis does not always deliver the full picture of the reality of research (the hurdles, practical matters, and mistakes), getting to a do a PhD is not always a smooth conveyor belt from undergraduate onwards. My return to academia, stepping away from clinical work, and juggling the childcare of three small children, has not been easy. Winning the grant helped to give me some validation about that decision. The day I met the other grant winners, was further confirmation that I was doing the right thing. We were all from very diverse areas of research, but had so much in common. The Gradconsult team were lovely, with a genuine interest in doing good things to support early career researchers. I am very happy to be associated with them. I am going to use the grant money towards buying an encrypted recording device for my PhD project. But most of all, to me, this grant has not been so much about the money. It's been about finding my research has meaning to other people, and their confidence in me as a researcher to carry it out.